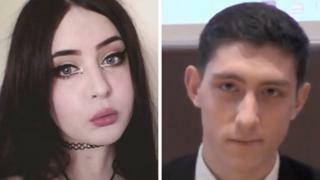 A neo-Nazi terror suspect entered a “Miss Hitler” beauty contest to attract new members to the far-right group National Action, jurors heard. Alice Cutter, 22, allegedly entered the contest after taking on the nickname Buchenwald Princess in reference to the Nazi death camp. She is on trial with Mark Jones, 24, of Halifax, Garry Jack, 23, of Birmingham, and Connor Scothern, 18, of Nottingham. They deny being part of the banned extremist group. It was outlawed under terrorism legislation in 2016. Opening the case at Birmingham Crown Court, prosecutor Barnaby Jameson QC said Miss Cutter’s partner, Mr Jones, visited Buchenwald in Germany in 2016. He is accused of posing for a photograph in the concentration camp’s execution room while giving a Nazi salute. Jurors were shown a picture of two men in the room holding a National Action flag. “Buchenwald was a Nazi concentration camp that stood out, even by the standards of Nazi concentration camps, for its depravity,” said Mr Jameson. He said Miss Cutter entered the National Action-organised contest in June 2016 – days after the murder of MP Jo Cox. The prosecutor told jurors: “On 24 June 2016 National Action staged, if you can believe this, a beauty contest [called] Miss Hitler 2016. “This was, no doubt, a publicity stunt to raise the group’s profile and attract more members. One of those who entered… was Alice Cutter.